Today’s feature property is a little different. We’re going to take you inside a cute building that has been realised as a café space, and local community gathering point. With a budget of HK$446,000 we’re really interested to see what has been achieved. Comfortable and cosy, this property aims to invite in individuals with its light-filled spaces and nostalgic yet modern atmosphere. 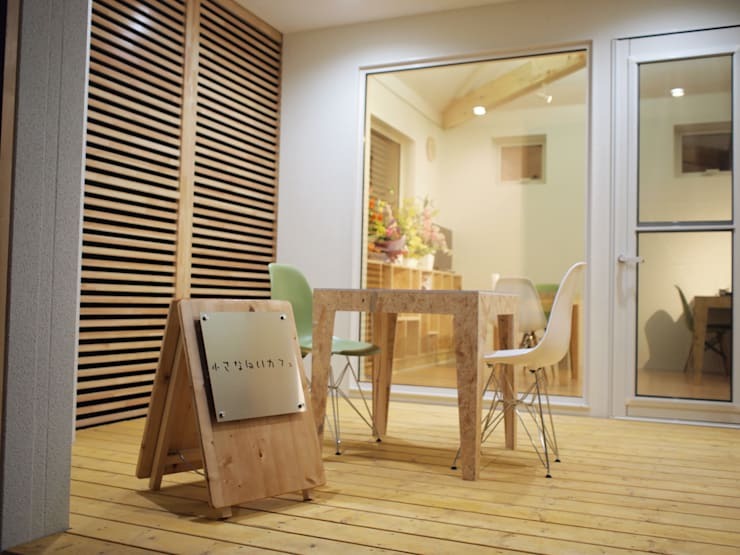 Designed by Yu Building Design Room, the café is located in Nemuro City, Hokkaidō, and services a population of around 300. As the area can reach -20 degrees during the winter, it was important to create a space that is both warm in the cooler months, and fresh in summer. Pretty as a picture, the first glimpse of this property shows us a traditional style structure, replete with four even-length walls, and a asymmetrical chimney. As the weather in this region plummets during the winter season, it was crucial the interior boast cosy heating. 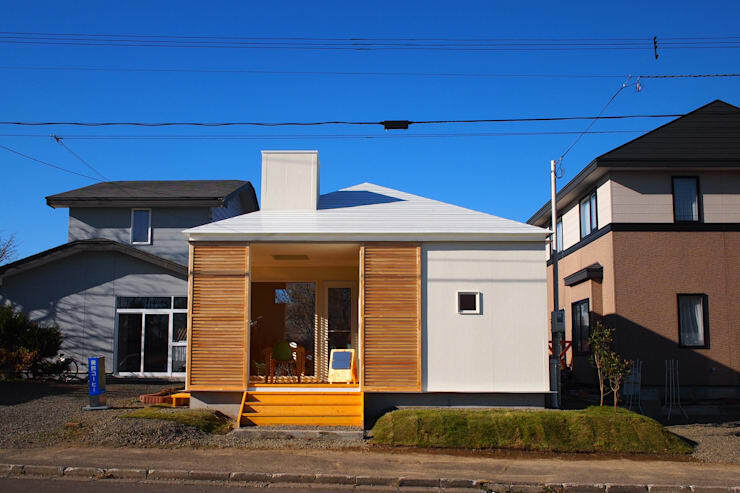 The frontage boasts a small square window, and yellow steps that lead upwards towards the open deck area. The open portico has two timber sliding doors that can be opened up during summer, while kept closed during winter. Inside the property the fit-out is sparse yet cosy. 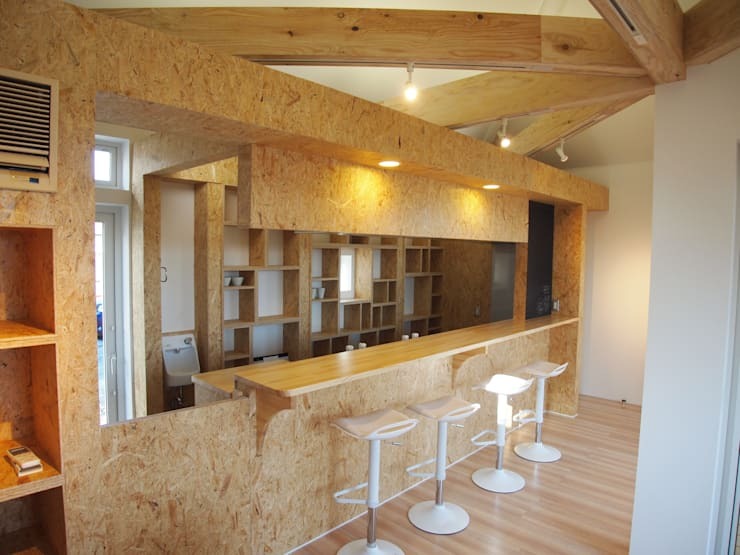 Raw timber particle board is utilised to clad the interior bar space, as well as some of the interior walls. Small white stools line the front bar, providing an inclusive area for customers and the community to gather. Exposed timber beams also impart a sense of warmth within the interior, adding timeless charm and character that is ideal for a cohesive and quaint atmosphere. As the budget was rather low, it was essential the designers implemented plenty of inexpensive shelving and storage ideas. 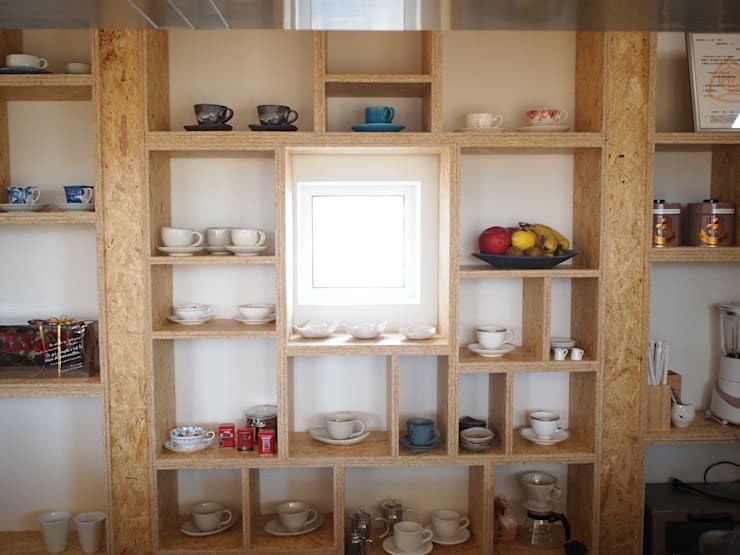 The costs were kept down in many different areas of the cafe, especially the joinery. Simple and effective, the different shapes add interest and energy to the interior, while ensuring the proprietors have plenty of storage space as well. 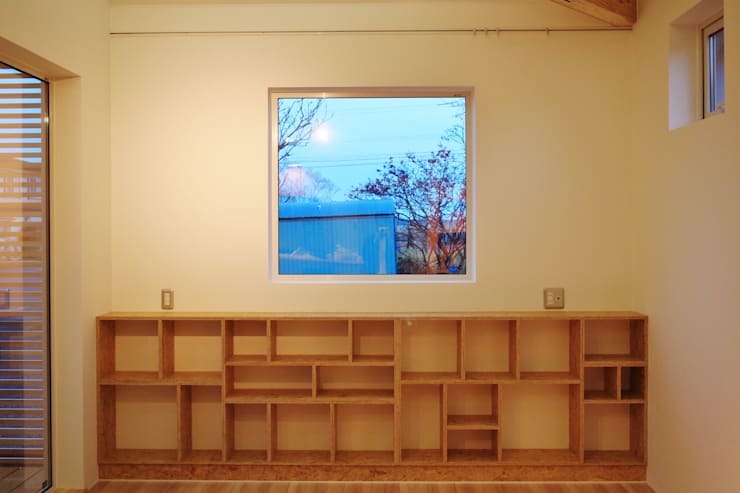 A small window lets in ample light, contributing to the practicality of the space. However, it is the decorative objects and crockery that personalise the space, ensuring it feels welcoming, lived-in and friendly. Due to the changing weather conditions, insulation was one of the most crucial elements to this structure's design. Also one of the most expensive elements when building a property, insulation is important as it reduces running costs, while making the interior feel warm and liveable. These small square windows add plenty of light to the compact space indoors, while ensuring occupants have something to look out upon. In fact, the windows act almost like a changing artwork, with seasonal shifts providing an ever shifting image for the interior spaces. The exterior deck is a great gathering space, and employs timber wall cladding along with wooden decking to offer a cohesive scheme and warm aesthetics. Everything here has been undertaken on a budget, but you wouldn't know by looking at it. The furniture is quaint, the signage minimal, and the overall style timelessly stylish. Did you think the result was successful considering the low budget?